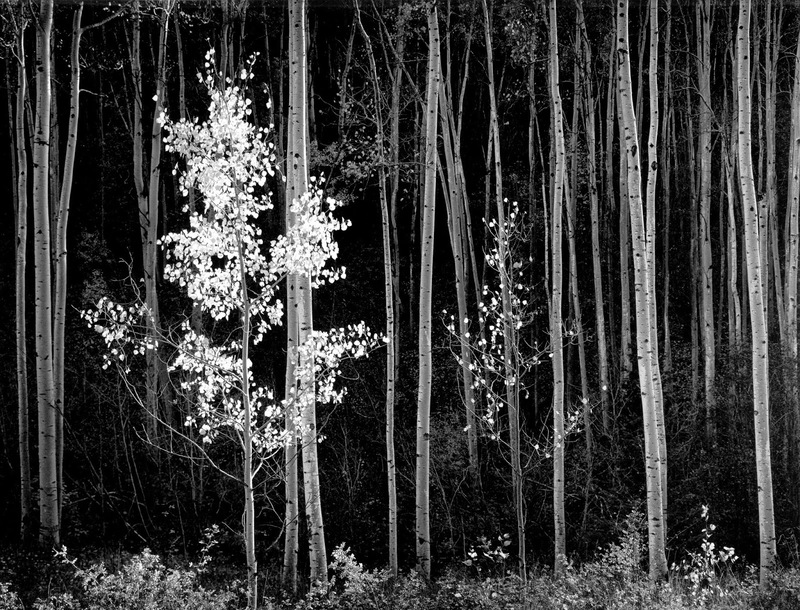 When I think about famous photographers, Ansel Adams is probably the name that pops into my head first. And I suspect that's true for most people, at least for us Americans. As the documentary describes, Ansel Adams has become known for capturing images that seem quintessentially American, in showing the vast space and grandeur of the American landscape. I knew I'd enjoy seeing more of his photography through this film. But I knew little about his life and was surprised to learn that he was born and lived for most of his life (when he wasn't in Yosemite) in San Francisco. I'm surprised that there isn't an Ansel Adams museum or some other such thing in SF -- I just went and looked on Google and it appears there isn't. Odd, yes? Apparently there are some of his prints at the SF Museum of Modern Art and the SFMOMA site has an interactive feature about his work on its site which I will go play with when I finish this entry. Anyway. I found it fascinating that he was a child during SF's 1906 earthquake -- and after being told that his nose veered sharply to the left after it was broken in a fall during the earthquake, did you find yourself looking at his nose in every picture of him as he aged?! I did. I also had no idea that he was as obsessed with playing the piano as he was with photography, and that he'd aimed at becoming a concert pianist. When someone on the film described how he'd spend part of the year at his home in SF playing piano feverishly, then head up to Yosemite in spring and summer to take photographs, I thought: "Multipotentialite!" Apparently we are not the only ones drawn to various different creative endeavors! And that of course leads to the way Adams used his darkroom processing to affect the resulting photographic image when he printed it. 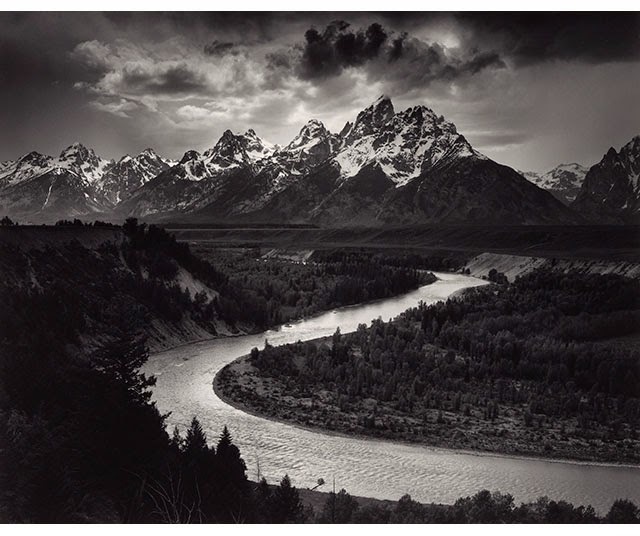 When people complain about using Photoshop or other digital processing devices to enhance images, I've often heard Ansel Adams' processing used as the justification -- "he did it, Photoshop is just another tool to do the same dark room processing." And it's true. I think that most people who take pictures casually think that Ansel Adams just had a particular knack for pointing his camera at something beautiful at the right moment, having no idea at how much adding filters and manipulating the tones of the image through dodging and burning were key to the images that resulted. That one woman (his editor, I think) estimated that 40-50% of the work (or artistry) on the image was done in the dark room processing. And that brings me back to the concept of processing a photograph to highlight what you want to say about an image. I liked hearing Adams and the experts talk about how it was that he did that. Making the sky darker to create drama, bringing out the lights and darks of the striations in the rock faces to illustrate strength, etc. It reminds me that the art of photography isn't just in knowing how to adjust the settings to get the depth of focus you want, or in composing the image to define the boundaries of the image. It's also about using color and light and tones to allow the photograph to say what you want it to, so it illustrates the truth you were feeling at the moment you clicked the shutter. The film also made me appreciate the total freedom we have today with digital cameras. 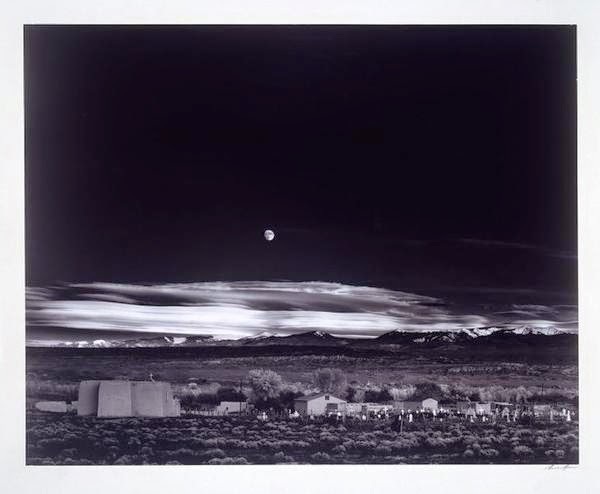 I loved hearing Adams' son talk about his taking his famous Moonrise over Hernandez, NM photo. As I was watching this, I was imagining your seeing it and wondering what you'd think. Can you identify a British photographer who is as famous to the UK as Adams is to the US? Do Adams' photographs seem less relevant to you because the landscape is not a familiar one? Is there work you know of (from any photographer) whose images capture the English landscape in such a definitive way? I'll be interested to hear what you think of this. And what's your pick for next week?